Richard reveals three rules, codified in his Decision Engine, that reduce the stress of trading. Every five weeks I share my Decision Engine's ranking table, which orders the shares I follow by the scores I have given them. 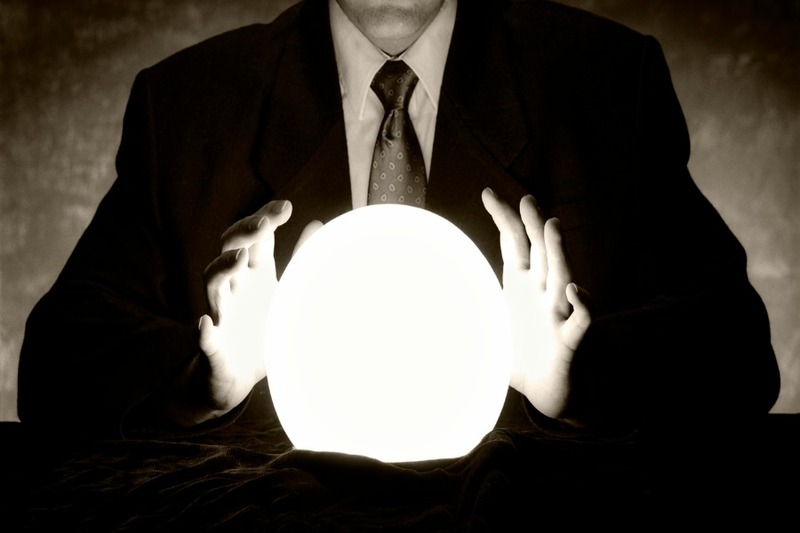 The scores are a measure of confidence a company will turn out to be a good long term investment. Each score out of 10 is the sum of five scores out of two, for profitability, adaptability, resilience, fairness and cheapness. In the four weeks between each of the Decision Engine updates, we publish individual profiles in which I explain the scores I have given a particular company, although the overall score changes every trading day because of the cheapness component, which depends on the share price. Since the last update, I have scored bottom-ranked SSP (LSE:SSPG), middle-ranked Shoe Zone (LSE:SHOE), and highly-ranked Victrex (LSE:VCT) and Dewhurst (LSE:DWHT), all of which have published annual reports in the last couple of months. I have also upgraded second-ranked Cohort's (LSE:CHRT) score for adaptability by one mark (from one to two). Cohort is a group of semi-autonomous defence technology businesses that is moving away from selling expertise to the Ministry of Defence, which leaves it dependent on one cash strapped customer, and towards developing and acquiring products to sell around the world. I think this strategy addresses the risk of further pressure on defence spending in the UK, and not just through the acquisition of more customers. It is easier to scale up the manufacture of products than it is the provision of consultancy services. While the Ministry of Defence is using more of its own resources for training and research, it is unlikely to develop and manufacture products independently. Ranking the shares obviously helps me to decide which shares to buy, and which shares to sell, which is why I call the large collection of spreadsheets from which the scores are derived a Decision Engine. But my ambitions for the Decision Engine go further. I do not just want it to tell me which investments are best, I want it to tell me how much to invest in them, when to buy, and when to sell. This update I am going to show you more than the ranking table, which is the orange section of the screenshot below. I am going to show you how it tells me which shares to buy and which shares to sell, and how big those trades should be. The portfolio I am using for this demonstration is the Share Sleuth portfolio, a model portfolio I run for interactive investor's sister publication Money Observer magazine, which is the red section of the screenshot on the right. It is a bit of an eyeful, but honestly, I am forever trying to simplify it. In fact, there are just three trading rules, which I will describe shortly. First, though, I want to appeal to your aesthetic sensibilities. 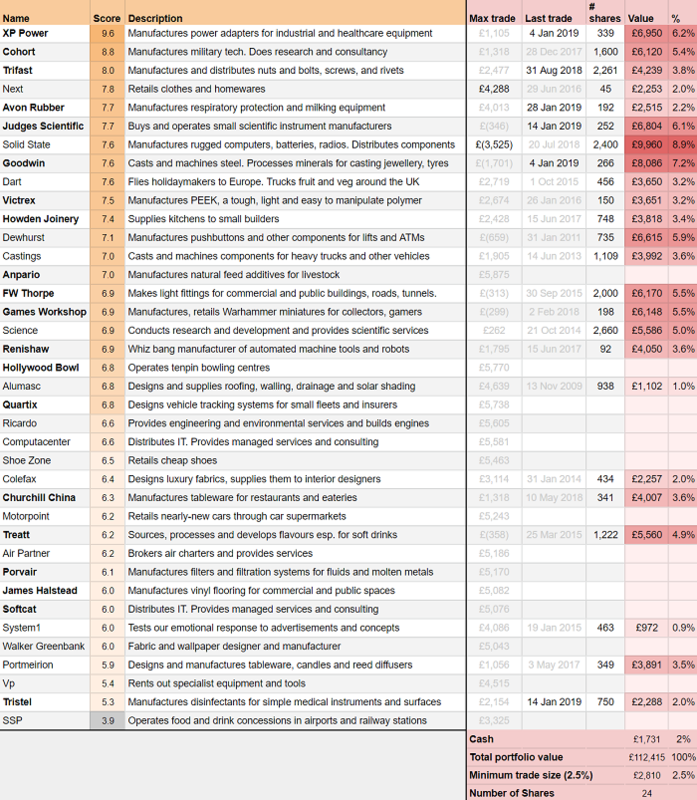 The highest ranked companies, those with the highest scores in the second column, are coloured the deepest orange. As the scores diminish the orange fades as gracefully as my son's new haircut fades from a mop-top to complete baldness at ear level. This (the spreadsheet fade, not the haircut) represents an ideal, never to be attained. The value of my holdings in the highest ranked shares should be greatest, and it should fade until somewhere between the fifteenth and twentieth ranked share I own none at all. The red columns are reality. They show the value of the holdings in the Share Sleuth portfolio, and that value as a percentage of the portfolio's total value (summed in the panel at the bottom of the screenshot). The darker the shade of red, the greater the value of the holding. Reality is not a smooth fade. It's more like my hair, a bit of a mess, but I hope you will agree the vast majority of the 24 shareholdings are highly ranked. Some of the lowly ranked shares I hold, like Treatt (LSE:TET) and Tristel (LSE:TSTL), are conviction shares. Their valuations are not attractive, but the businesses score highly and I want to keep a modest holding even if there are higher ranked shares available to buy. Their names are in bold. By following three rules, The Decision Engine is prompting me to make two trades, which you can see in the "Max trade" column. It wants me to add to an existing holding in Next (buy shares worth £4,288) and to reduce a holding in Solid State (sell shares worth £3,525). Both shares are highly ranked, but the current value of the portfolio’s holding in Solid State is a hefty 8.9% of the portfolio’s value. The value of the portfolio's holding in Next is only 2.0% of the total. The Decision Engine calculates how many shares I would need to buy or sell to achieve the ideal size by deducting the actual size of each holding from the ideal size. The difference is listed in the “Max trade” column. I cannot just trade every time there is a discrepancy, otherwise I would be trading like a maniac every day - the opposite of what I want. Hence the rules. 1. A trade is smaller than my minimum trade size, currently defined as 2.5% of the total value of the portfolio. This is because I want to trade in meaningful amounts only. 2. A buy is ranked less than seven, so I only invest in my best ideas. 3. A trade is within six months of a previous trade, so I take things slowly. It guarantees I will have seen at least one more set of results before I trade again. Another uncodified, rule also slows me down. I tend to buy or sell at or near the minimum trade size, so it takes at least two trades, or a year minimum, to reach the ideal size (unless the share price shoots up). In practice, the maximum holding size is 10% (7.5% plus 2.5%) and the minimum holding size is 2.5%, although I would be happy to break these rules rather than do anything barbarous. Why not just make decisions on the fly? The old advice, never to invest more than you can afford to lose in the stock market is hogwash. My investments are my pension, and I cannot afford to lose them. With so much at stake, I dither and prevaricate, and dilly-dallying is not productive. Research adds value. Understanding what we intend to own adds value. These aspects are sometimes difficult, but always enjoyable because we are learning and the pressure is off. There is no money at stake until we actually trade. Everybody seems to be looking at artificial intelligence to make intelligent decisions for them. My ambitions for the Decision Engine are rather more modest. I just want it to calculate valuations and implement the simplest of rules without hesitation, which is what computers are really good at (when provided with high-quality information). That frees me up to feed the engine with the information. I supply the intelligence, and for me, that is the perfect division of labour. Will I reduce my holding in Solid State? Almost certainly, and probably soon. Will I add more Next? I’m still dithering about that! But at least the Decision Engine has reduced the number of things to dither about. *In fact there is another blue section of the Decision Engine spreadsheet, which is my own portfolio. Although the sums invested differ, the pattern is broadly the same as for the Share Sleuth portfolio. My personal portfolio is concentrated in the highest ranking shares, with a few outliers, because I eat my own cooking. Richard owns shares in Cohort.